Also called the “urban herding sport”, Treibball mimics herding techniques using exercise balls instead of real sheep. Come and learn how to play Treibball with your dog! Show off the tricks your dog already knows and learn new tricks to earn a title! Our instructor can mark you off for tricks shown at class and you can earn a Novice, Intermediate, Advanced and Expert Trick Title! What a fun way to improve your dog’s skills, focus and attention! Come with your puppy as early as 4 months of age. Guide your dog safely over different obstacles and later through a course of obstacles. Jumps, tunnels, A-frame, dogwalk, teeter totter and weaves are all introduced in the first class, then in follow-up classes we add distance control, side-changes and speed (if we want to). Try out several sports in one 6-week class! We’ll feature three different sports, every sport for two weeks in a row. At this point it could be a combination of the following: Freestyle, Treibball, Trick Dog, Agility. If the class doesn’t contain agility, dogs can be as young as 4 months of age. If the class does include agility, dogs should be 6 months or older. Join this fastest-growing sport in the country! Channel your dog’s sniffing passion into a controlled exercise, teaching your dog to focus on one task, to ignore distractions, to gain confidence and to find a specific odor just for you! Having the dog search for something is the most natural exercise you can give your dog, better than retrieving and fetch games! You mimic the track and search behavior, rather than the chase behavior of a wolf. The tracking and searching is very tiring for a dog, mentally and physically. The fetch games (copying the chase after a rabbit, when they need to activate all reserves to catch that rabbit) increase the dog’s arousal level instead of tiring their mind. They might get physically exhausted, but mentally they get aroused. Play fetch only 2-3 times in a row, then change to nose exercises! Want to give mushing a try but aren’t sure how to start? Learn more about it here! 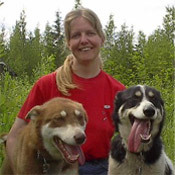 Read our January 2012 newsletter-story to learn more about mushing with pet dogs.